I’ve become quite attached to Twitter lately, as several of my blog posts will attest. I use it for a wide range of things; a source of news (technical and non-technical), to chat with friends and share things I find of interest, to ask and answer questions on Macs, Ruby on Rails, etc. and finally to banter about my favorite sports teams (Redskins and Caps, thank you very much). Given this wide range of uses I tend to be accessing my Twitter feeds throughout the day and the web interface simply doesn’t handle things the way I need it to. As a result I use a custom client to access Twitter. A custom client presents Tweets in their own interface, accessing the data through the Twitter API. You drop in your Twitter username and password and the custom client takes over from there, presenting you with a view of your Tweets and the ability to create them as well. Over the last few months I’ve tried a number of different Twitter clients for my Mac. First it was TweetDeck, an Adobe Air based client that does a great job of breaking Tweets up into separate and configurable panels. Next I tried Nambu, a native Mac OS X application that showed some real promise. 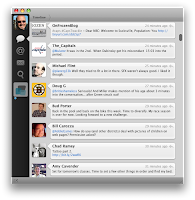 Nambu leveraged many of the same UI elements that TweetDeck did, but it was packaged into a much more Mac style application. Finally Tweetie was released for Mac recently. A popular iPhone Twitter client, Tweetie has a graceful interface that puts a different look and feel on Twitter than TweetDeck and Nambu do. Each of these applications has strengths and weaknesses, which I will try to identify below. Summary: TweetDeck is great for people that follow a large number of folks and want to break up their Tweets into custom groups. If you can get over the fact that TweetDeck does not look like a native OS X application it’s a nice Twitter client and is used by an extremely large number of people. It includes lots of little niceties to make creating, replying and ReTweeting posts very simple. I like that I can click on a person in a list and quickly see their profile and that each Tweet contains virtually all of the information available. Want to know what a Tweet is in reply to? Click the “…in reply to…” text on a Tweet and it loads up the original Tweet in your web browser. The reason I started looking around at other clients after I had been using TweetDeck for so long was the fact that I wanted something that actually looked like a Mac application. That and the memory leaks in TweetDeck meant you couldn’t leave it running for days at a time without it continually chewing into your memory pool. Even with these issues it is a very capable Twitter client. It’s pretty clear that Nambu will strive to be a one-stop social networking application. Though it is disabled in the current beta there are placeholders for FriendFeed, Identi.ca and Ping.fm. If your goal is to keep everything on the social side in one place then Nambu may have an answer for that in the long run. Strengths: Native Mac application. Extremely stable and quick, very resource efficient. User interface is very powerful, especially for navigating across “conversations”. Keyboard friendly for nearly all navigation and input. Tear off search windows provide great flexibility. Multiple account support. Weaknesses: Doesn’t provide user name auto-complete. No support for Groups. Keyboard navigation within Direct Messages is quirky. By far the most powerful part of Tweetie is the ability to navigate your way through conversations. If you see someone you follow respond to a person that you don’t follow you can quickly jump to that string of Tweets. It makes reading Twitter feeds much more conversation friendly. Not only can you jump in but Tweetie maintains the context you are coming from so you can navigate your way back out to where you started. From a functionality standpoint TweetDeck and Nambu are on pretty equal footing. If you follow a large number of people that generate a lot of Tweets, you will appreciate the ability to break your key followers up into groups that you can monitor more easily. I’ve had people follow me on Twitter that have thousands—sometimes tens of thousands—of people THEY follow. Clearly no one can even use a Twitter timeline that contains that much traffic so that grouping and filtering feature both TweetDeck and Nambu have would be critical. I’m hoping that once Nambu comes out of beta it’s performance will pick up and the memory leaks will be eliminated. Until then TweetDeck is a lot more stable, though if you have multiple Twitter accounts Nambu is the better option. If you don’t follow a huge number of people and can get by without the group functionality then Tweetie is an outstanding Twitter client. The user interface is simply fantastic, looking and feeling like a native Mac application. It is currently available for $14.95 through May 4 ($19.95 after that). I am personally using Tweetie now; the other features have made me forget about the lack of groups and I don’t really follow that many people. I’ve done some previous blog posts on both TweetDeck and Nambu that have more detailed information. If you want to learn more about Tweetie I highly recommend that you watch Don McAllister’s excellent video tutorial on it. Got a Twitter client you really like? Drop a note about it in the comments and share what you like and don’t like about it.